Contour Heating Products Ltd > News > Are LST Radiators Suitable For Wet Environments? In schools, hospitals and residential care homes, a properly working heating solution is vital to ensuring complete comfort for staff and service users and to maintain compliance with working temperature regulations. This includes bathrooms, shower rooms and toilets. Many of the clients that we deal with from the commercial sectors are concerned about the suitability of LST radiators in wet environments such as these because of the water presence that is found there. Here at Contour, we have been blogging about our LST radiators and why they’re suitable for wet environments. 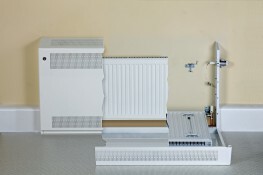 An LST radiator installed into a wet environment such as a bathroom has a high chance of coming into contact with water as a result of the steam generated by showers and any water that might be spilt from taps or appliances and around hand dryers, although water volumes here would be quite small. Despite this, a constant presence of even small amounts of water can cause issues for metal appliances if they are not properly protected. If there is exposed metal on the radiator covers or the radiators themselves, the chance of rust developing goes up. If rust does occur, the integrity of the LST radiator can also be affected. This is a concern in environments where heating solutions need to be durable and robust, such as mental health wards, hospitals and care homes. LST radiators need to be designed to protect against the risk of rust and corrosion. This achieved with the use of the correct materials for the environment and quality powder coating that prevents exposures that could lead to rust. To ensure that LST radiators are suitable for wet environments where moisture levels are high, Contour can provide heating solutions that use materials specifically designed for this kind of setting. Our standard LST radiators are made from 1.5mm Zintec steel which has properties that help to protect the LST from rust and corrosion. However, for wet environments the most suitable material that we can supply is magnelis steel. This material has undergone an additional treatment stage which makes it more durable, and therefore better suited, to wet environments. The treatment stage is similar to hot-dipped galvanising but the process is more environmentally friendly, making magnelis a more sustainable option for these spaces. LST radiators constructed from magnelis steel are installed into mental health spaces and areas that have anti-ligature concerns. If the environment is not a mental health care space then LST radiators are supplied with aluminium. For additional reassurance, our LST radiators are coated in BioCote® powder coating which contains anti-microbial technology to help reduce the number of potentially harmful bacteria on the surface of the LST radiator. In hygiene conscious environments such as hospitals, this is particularly beneficial because it helps to combat wide range of dangerous bacteria, including MRSA and E.coli. Contour LST radiators are designed to be more resistant to rust and corrosion. This makes our LST radiator suitable for wet environments across a number of sectors. The materials and powder coating create the ideal heating solutions for bathrooms, shower rooms and toilets throughout the education, healthcare and residential care sector.